KETO BALANCE is not the same as any kind of exogenous ketone or insta-ketones or anything like that. Two completely different worlds. KETO BALANCE is focusing on allowing your body to create more of its own ketones make more of its own energy utilizing the right balance of fats, whereas exogenous ketones and insta-ketones are really an artificial form of ketones that are going into your body. If you use artificial ketones they go to the front of the line for energy. You have the ketones that your body is producing from fat when you’re in ketosis, but if you use artificial ketones those go to the front of the line and have to be burned first before you ever start burning fat for fuel. 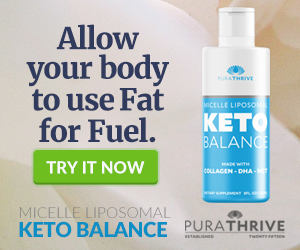 The whole idea with KETO BALANCE is to allow your body to use its own ketones; you’re making ketones utilizing the medium chain triglycerides, but also having a sustained release of ketones coming from the DHA from algal oil. This is a very high quality form of omega 3 and it’s actually derived algae, but doesn’t taste like algae because of the delicious chocolate flavor of this formula. KETO BALANCE is also a great source of collagen, which is is great for supporting liver health. This is very important for those following the keto lifestyle, since it’s your liver that is creating the ketones that are necessary for your success. Not only are you supporting your connective tissue in your hair skin and nails but you also can help facilitate the right kind of protein synthesis so you can maintain your muscle or even build muscle, if that’s your goal. So don’t fall victim to exogenous ketones that you don’t need. We’re all about trying to allow the body to do the best with what it already has.